Before heading on to the different approaches, a fundamental decision needs to be made; will you migrate or start over? This article takes a dive into migrating your data, but deciding to start over can be a smart one. Don’t move too quickly and ask yourself the question if it might be better for your business to start with a fresh platform and a clean product, order and customer database. Migrate the data from Magento 1 to Magento 2. While both approaches might seem quite the same, in practise they are quite different. Both approaches are comprehensive ones and come with pros and cons. Continue reading to understand which approach could answer to your needs. The Data Migration Tool from Magento is a command-line interface (CLI) used for transferring data from Magento 1 to Magento 2. As Magento’s website describes: “The tool verifies consistency between Magento 1 and 2 database structures (tables and fields), tracks the data transfer progress, creates logs, and runs data verification tests.” The migration tool also offers the possibility to use delta migration, which means that it’s possible to update database records with changed data after an initial database migration. While the solution offers a solid way of migrating the database, it also comes with limitations. When you want to reduce the risk and possible impact of deploying the new platform, you might not want to swap to the new platform entirely overnight. If you prefer to take smaller steps of deploying your new commerce sites (ex. per domain or per country) the migration tool won’t be a suitable solution for your business. It’s ideal when you have one main store and the user experience remains untouched. It migrates the database to the new version, resulting in possible unwanted legacy data in your new platform. 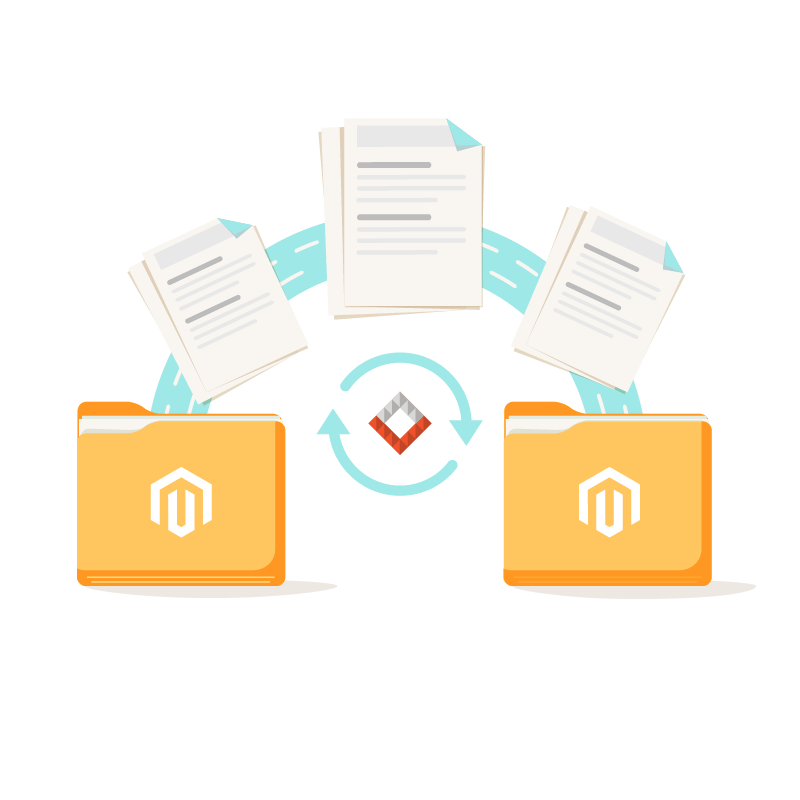 Another approach on migrating to a new version of the Magento platform is to decide which data you want to keep / reuse and to send the data to the new platform through a data integration platform such as Magement. Extracting the data from Magento 1 can be done with its API, but considering the previous mentioned larger retailers, it would most likely require an addition (extension) to Magento 1 that allows the data integration platform to extract data in large numbers at a time. As Magento 1 is around for almost a decade, the majority of Magento solution agencies offer solutions to extract data from the platform in large numbers at a time. Adding data to Magento 2 runs through the API, which is much more advanced than its predecessor and which is being enhanced by every minor version update. As Magement offers detailed configuration abilities to publish data to Magento 2, the data flow can ben tailored to ensure that - for example - products are added in the correct sequence. This means that when configurable products (like clothing with multiple sizes and colors) Magement will send the simple products only after the configurable product has been added to Magento 2. As the source of the data is not always Magento, you also have the ability to connect other IT systems to Magement. So when the master product data comes from an ERP (Enterprise Resource Planning) system and enriched data comes from a PIM (Product Information Management) system, Magement will publish the complete product data to Magento 2 when everything is complete. On the other hand, data that is stored in Magement can be reused, restructured and published to other IT systems. It is ideal when you want to roll out the new sites one after the other, minimising risk and allowing time to gather feedback and analytics on the performance of your new platform. This approach will give you the ability to have multiple platforms in production mode, which will take more time overall to finish the entire migration. As explained, both approaches serve the same purpose for a different use case: allowing you to upgrade to the new version of Magento. If you’re looking for a solid way to move to Magento 2 and you don’t need a real life production version of your new platform next to your current one, the Migration tool of Magento will serve its purpose. If your business would like a more stepping stone approach and risk management important is to your business, migrating with a data integration platform such as Magement can benefit your needs. Good luck migrating to your new Magento site and we hope that we gave you some clear insights in the different possibilities. Do you need to migrate your data? We’re here to help. And if you have custom integrations too, you’re in the right place.